Scott (Center for Advanced Study in the Behavioral Sciences at Stanford University) does not set out to debunk or substantiate these claims of miracle cures, but rather analyzes them from a sociological point of view. In this he succeeds. The book's first chapters set the stage in Christian Europe with detailed descriptions of medieval life, conditions of poverty, malnutrition, poor hygiene, and crowding. He suggests that these could have led to and fostered the many ills rampant in the population, which he surveys. Once the stage has been set, Scott introduces the characters in the drama: the saints to whom medieval people turned for help and salvation. There are several ah-ha moments in the book when these characters are seen through a sociologist's eyes. Thus, it appears that medieval Christians accepted as fact that there were certain things that saints could do and other actions that lay beyond their powers. For example, they could cure blindness but could not reattach a limb. Scott also deconstructs the system by which miracle cures and sightings of apparitions were disseminated. He likens that to a modern public relations campaign, in which it is always humans who do the disseminating. In comparing the process to our modern publicity machines, Scott does not disparage the system or the event, but simply analyzes the methods involved. The author similarly analyzes the why and what of pilgrimages: why would an individual undertake such a daunting task, when in those times going on a pilgrimage was no small feat, involving extensive preparation and considerable risk? Scott suggests a variety of motivations, which range from the serious (seeking cures for illness, escaping dire circumstances, the draw of the supernatural, and devotion to their faith) to the mundane: "an excuse to travel" or "the prospect of a partially subsidized vacation!" Such insights allow the reader to relate to the material and understand it in more personal terms. This is not to say that Scott dismisses all such miracle cures as just the placebo effect. He devotes three chapters to discussing the effects of stress on illness, belief on healing, and the social world on both. These provide an excellent summary of the modern body of work that in recent years has elucidated not only that the mind and emotions have a very powerful effect on health and illness but also how this effect occurs. Taken together, the structure Scott provides—outlining exactly how medieval pilgrims left oppressing situations and were then exposed during their journey to social support, clean water, and fresh, healthy food—makes a strong case for the effectiveness of the simple act of going on a pilgrimage as a healthy endeavor, which could have begun the course of healing. The added power of belief in healing, through the placebo effect and the many nerve chemicals and brain hormones released in such states, almost ensures that people who engaged in such activities would feel much better, if not be cured from illnesses that would today be considered "self-limiting" under the right circumstances. 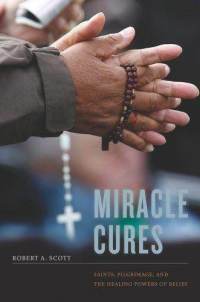 Implicitly, Miracle Cures suggests that a parallel situation might be propelling some of the resurgence of modern-day seeking of spiritual solutions for physical ills. Although the physical conditions fostering illness in the developed world today are a far cry from those in medieval times, we are certainly exposed to a vast array of emotional stresses, which may trigger or worsen many illnesses. The power of belief and the lifestyle and social changes that go along with it may indeed assist many in their search for healing. Okay, this books sounds very interesting. However, I hope the book also devotes some space to modern pilgrimages, where people get sick from exposure to germs and other diseases that their bodies are not used to. Some of the rituals associated with holy sites involve drinking water - sometimes sharing the pool with hundreds of people at the same time. Or a gathering like the Hajj, where each year 2 million people gather together from countries around the world. In modern times, are we also looking at pilgrimages as "anti-cure"? Read the full review here (you may need subscription to access it). Also, if you are interested in these issues, you should definitely check out Tom Rees' blog, Epiphenom. I'm reminded of Francis Galton's study on the efficacy of prayer. By the way, you do not mention the full name of the author in the post. My fault. I have added the name - It is by Robert A. Scott.